2014 Genuine Leather Notebook, Equally versatile for one’s home, work or social agenda, including recreational travel information, US festivals and events. It offers a yearly notebook with week-at-a-view appointment pages plus notes. International city maps: Athens, Budapest, Cairo, Delhi/New Delhi, Frankfurt, Hong Kong, Jerusalem, Kobe/Kyoto, Lisbon, London, Madrid, Mexico City, Milan, Montreal, Rome, Osaka, Paris, Prague, Seoul, Tel Aviv/Yafo, Tokyo, and Vienna. 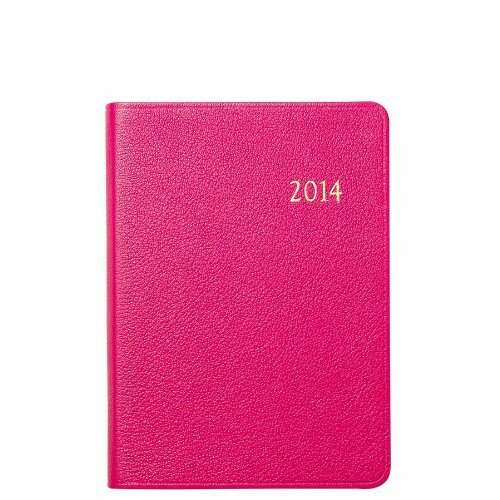 2014 Genuine Leather Notebook with 224 Cream-white acid-free pages with gilt edges. 400 calendar, appointment and resource pages in two colors, 16 map pages in full color. Previous, current and next year’s calendars, Month-at-a-view appointment pages, Next-year-planning. Double-faced cream satin ribbon marker. Smyth sewn for strength, longevity and openability. Nice old-fashioned quality agenda These agenda come complete with maps, useful information, and very good quality soft leather. Also, nice cover color palette to choose from. Great choice if you are looking for an old fashioned European agenda. Only regret is that paper is not more fountain pen friendly.